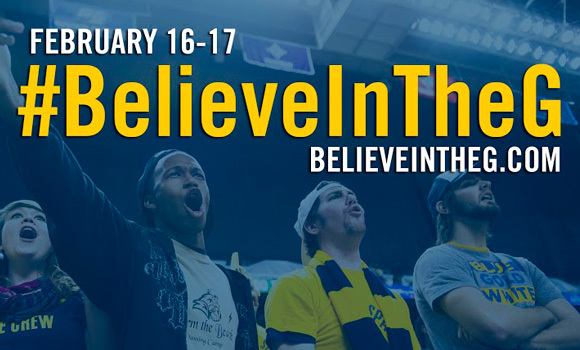 That’s the question UNCG will be asking alumni, parents, faculty, staff, students and friends this week as it holds its third annual #BelieveInTheG 48-hour giving campaign Feb. 16-17. UNCG is asking 800 Spartans to make a gift during the campaign and to share their story on social media using the hashtag #BelieveInTheG. Gifts can be made at BelieveInTheG.com. Whether you’re a community partner who has been impacted by the service of UNCG students or an alumnus who has enjoyed a successful career, the university wants to hear from you. UNCG has also tapped “challenge donors” to encourage giving. Jeff Collins ’84; Brandi Johnson ’09, ’14; Angela Polk Jones ’89, ’07 MSA; Tom Martin ’70; Mary Napier ’68; Nicholas Rau ’04; JoAnne Safrit ’57; David Schuck ’02; and Jana Welch Wagenseller ’76 have pledged to give a total of $75,000 if the university reaches its goal of 800 donors in 48 hours. Last year’s campaign was a huge success, with the university raising more than $125,000 from 604 donors. To learn more, visit BelieveInTheG.com.